VeEX VePAL BX100AT Broadband Expert is a next generation testing solution for ADSL and ADSL 2+ networks supporting voice, data and video services. The BX100AT comes in a robust handheld package packed with powerful and flexible features for the field test environment. The BX100AT is suitable for use by field engineers or technicians installing and maintaining triple play networks. The BX100AT’s extended battery life and advanced complete set of features make the instrument a suitable tool for DSL triple play network testing. The BX100AT has a high resolution colour touch screen with intuitive GUI suitable for reading in any light conditions. The BX100AT features FTP and Web verification with results uploaded through LAN or DSL links to remote FTP site once link is established. 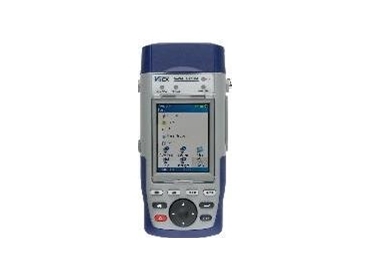 The BX100AT also has an on board Web browser, WiFi site survey and Internet connection verification and true modem emulation. Other features of the BX100AT include automatic link turn-up after power on; advanced ATM functionality; IP connectivity tests: ping, trace route, echo response, DNS support; IPTV function with stream display capability; VoIP suite for performance analysis and call emulation; test profile preloading and/or centrally managed. The BX100AT is available from Tekmark.